TOKYO - Belgium's David Goffin beat Adrian Mannarino of France in straight sets to win the Japan Open on Sunday, his second victory in consecutive weeks. Fourth seed Goffin prevailed 6-3, 7-5 in one hour and 24 minutes against the unseeded Mannarino in the final at the Ariake Coliseum, capturing his fourth career title. It was Goffin's second straight final at the Japan event after he went down last year to Australia's Nick Kyrgios. Mannarino, who defeated Croatian top seed Marin Cilic in the semi-finals on Saturday, temporarily took the initiative in the second set after being overmatched in the first. But Goffin, 26, persistently closed up and eventually went past the Frenchman after breaking at 5-5. "It wasn?t easy," Goffin said afterwards. "The final is always tough, to manage the emotions before and during the match," he said, according to the ATP World Tour. "At the end I started to be a little more aggressive on the return of serve, and I was pleased to come back and break him at 5-5." Goffin also won last week, at the Shenzhen Open. "I got the break in the second set but couldn?t hold my serve," Mannarino said. "The quality of the game was really good but I wasn?t good enough compared to him," he said. "I?ve had a pretty good season, definitely my best so far." The Japan Open has been played since 1972. Previous winners include a roll-call of the game's greats, including Ken Rosewall, John McEnroe, Pete Sampras, Roger Federer and Rafael Nadal. 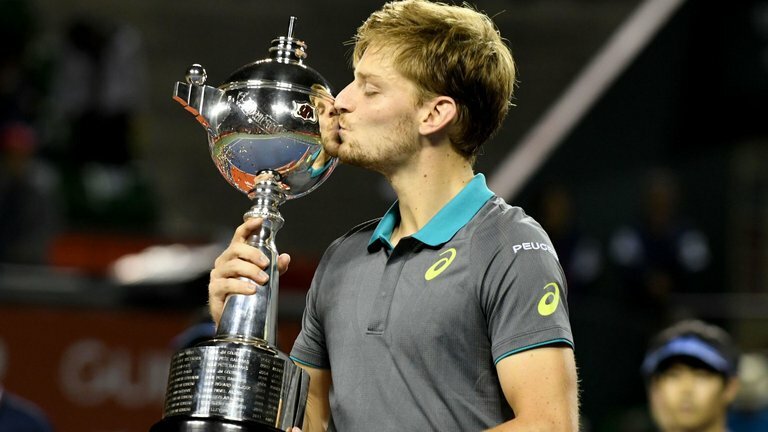 Belgium's David Goffin beat Adrian Mannarino of France in straight sets to win the Japan Open on Sunday, his second victory in consecutive weeks.